I think I drafted Guilds of Ravnica 2-3 times with real cards before the format rotated. Fall was not a kind season for my free time. The advent of Magic Arena has also slightly quelled my desire to trek out in the (often) freezing cold late at night only to find not enough people show up for a draft to even fire. This prerelease was guaranteed Limited play so it was a welcome change and a return to form. I remembered why I stopped doing these midnight prereleases when I got to the store. A relatively small upper floor space was packed to the brim with nerds of all shapes and sizes. Didn't smell particularly bad or anything, but standing room only in a place like that leaves much to be desired. It was the only way to get my obligatory two PRs in though. I chose Gruul for seeming metagame-y reasons----it simply seemed like the strongest guild by far. Wasn't pumped that I didn't get to play many of my rares (which mostly sucked) but the deck felt pretty strong regardless. Game 1 was incredibly slow on both our parts. I had a hand full of big beef and he had a hand full of spell to use them on, I suppose. We both played draw-go for a while until I felt comfortable enough to start dropping some creatures into the expected counters and tricks, which were promptly used and my creatures removed. Eventually I stuck a couple of Gravel-hide that could attack through his tiny blockers as I'd threaten to pump them up . I drew out one final counterspell and then threw down a big ol' Hoof lite for the win (End-Raze Forerunners). Game 2 he didn't do a whole lot once again, had a few measly Thopter tokens and Spirits, against which my 3/3 that acn't be blocked by tokens came in handy. He eventually dropped an Eyes Everywhere but it was way too late by that point. He had showed it in the game before so I had debated siding in a Simic guildgate to steal something back in case he stole something from me, but decided it probably wasn't worth it. I've played against this guy before, think he was my win-and-in to top 8 during some Game Day...Eldritch moon maybe? Anyway, Game 1 I mulled to 5 and never drew red mana. Game 2 I ran him over right wuick before he could draw any blue mana. Game 3 was the real game we had both hoped for. I removed a few of his dude but not before we had chunked each other a bit. He had me at 9, I had him at 8. He plays the 2/5 unblockable guy and a fish crab (which can grow to 5/5). I figure I have a decent board with bigger power than him so I can attempt to race---I can't attack into a 5/5 but I can into a 2/5. I take him down to 5 on my next attack and manage to scry a +3/+3 pump to the top of my deck to try to smash and win next turn. He tempos me out with 6 mana bounce two guys, one of them on top of my library. Bye bye, scry. I replay my 4/4 riot creature and pass, he double spells with an aeromunculus and a 2/2, swings with the unblockable guy. Instead of replaying my other creature I'm able to 2-for-1 him with Flames of the Raze boar to all but wipe his board and swing in and drop him to 1. If he top decked a blocker he'd likely be able to win before I could get through it to finish him off---he top decked a land and conceded. It was super late and most people just wanted to go home by that point---the difference between 8 packs for 3-0 and 4 for 2-0-1 is also decently substantial so I split with my round 3 opponent and jetted. Felt like my deck overperformed a little bit maybe, not 100% i built it right in hindsight now that I'm looking back at the pool, but I did well enough. My usual 2HG buddy was away on vacation so I was stuck doing a couple on my own. Opted for Simic this time because again I was kinda meta-ing and also some of the sweet pulls were in Simic. I kinda hate the guild pre-packs for this reason though. I don't like being tempted into metagaming the prerelease or fishing for money pulls. I also don't like how the guild packs half build your pool for you. I hope the Prerelease format goes back to normal after this. 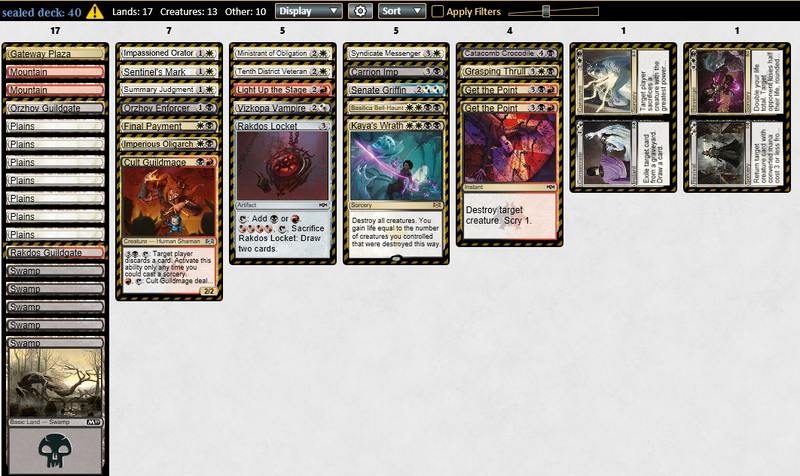 The rares here were WAY better than my previous pool, but my mana was absolute garbage. I really wanted to go Bant but I had no gates to help me play those three colours (and 3 Orzhov gates...bleh). The power in Simic thanks to the guild pack was too much to be denied so instead I went Temur (blue/green/red) for Electrodominance. While we were sitting and building the pools the guy next to me picked Azorius and opens Domri Rade and a bunch of Gruul rares. I offered to trade some stuff with him and he laughed. Then a guy in the back yells at the top of his lungs and is celebrating like crazy---at the time we didn't know why, but I was going to find out. blanked an attack from my 7/7 one turn) hence the Domri whiffs. We rebuilt his pool after the match as azorius because it was way more consistent and played a ton of top end fliers and tempo cards. I forgot to actually check and see how his last two rounds went. Oh well. Manipulation and I never saw it. Didn't seem like he had the mana for it, but I guess it must have worked for him in previous rounds?. Always right to split the final round if the prizing is solid. Not much else today. Stuff I learned: I just really don't like the guild pre-packs. I already talked enough about that. Also considering how well I did despite having no confidence in my second deck at all, I always seem to forget that average skill level in person vs. MTGO is lower. This format looks like it could be a lot of fun, but I guess we'll see. I'd love to draft more of it but only time well tell if I'll have the chance. As always, comments/questions are more than welcome, and in fact encouraged. Any mistakes in my building or advice is always up for discussion. If there's anything anyone reading this does not understand I'd also be more than happy to explain some of the terminology or choices I made. This is what I would have built for your first pool. It's a little light on three drops, but I'm still unsure exactly how valuable three drops are in a world of lots of gates. In general I think you value combat tricks too highly and the crocodile not highly enough. That guy blocks everything in the format. I can't get enough of him. LOVE posts like this, thanks so much for putting in the time and effort to do write-ups like this! Stony Strength > Gift of strength. 100% always especially if you have adept synergy. Combat math is pretty even in this format as in creatures are always going into combat within 1 power/toughness of the defenders so stony strength has been bonkers for me. 3-0-1 my first one with simic running 2 of them and 0 gifts. azorius is a good guild surprisingly, i think your 2nd pool might have had a good deck in there too. I 4-0d with it my 2nd run through. A little late seeing this, but thanks those who have responded. I keep doing these mainly as an exercise for myself but if other people get enjoyment out of them I have no plans on stopping! @mizenhauer knowing what I know now about the format, I like your build better for sure. I'm always real interested in people's different takes on sealed pools, and it highlights all sorts of skills you don't get with constructed play. @flashftw would probably agree with you at this point. Combat tricks aren't super valuable in this format it seems, and stony strength doubles as a combo piece for stuff like sharktocrab for example.